Le Mans Series newcomers Team RLR achieved the team's objective of finishing the squad's debut race at the Hungaroring - and collected a top ten class finish in the process. 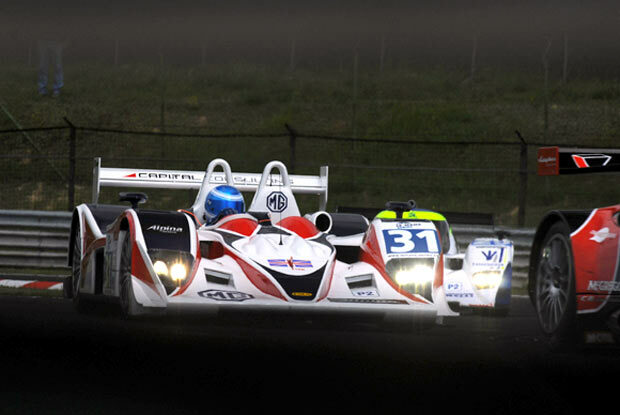 The Bolton-based outfit, comprising of LMS debutants Barry Gates and Rob Garofall plus former RML Le Mans 24 Hour class winner Warren Hughes, guided the MG Lola EX265 to eighth from 17 starters in the LMP2 category and 18th overall of 37 in a demanding night race at one of Europe's most technical circuits. A good qualifying run by Hughes in the morning session placed the number 31 car 13th overall on the grid, setting the team up nicely for the 1000km race. However, the opening laps proved to be testing for the squad as Barry Gates suffered a spin then a momentary engine failure that resulted in the MG Lola being collected by another car. A twenty minute pit stop was required to fix the damage caused by the shunt, dropping Team RLR right to the back of the field. However, once Gates returned to the track he started to find his rhythm and immediately set about making up the lost ground. By the time he handed over to Warren Hughes a third of the way through the race Team RLR was 13th in class & 33rd overall. Warren Hughes wasted no time in showing his well-known ability to produce consistently fast lap times in a prototype endurance racing car. The Newcastle-born driver began to cut his way through the field in clinical fashion as the light faded over the historic track outside Budapest. Hughes' pace, combined with the high attrition rate among competitors ahead in the field, saw Team RLR move up to 10th in class and 26th overall before he came in to hand over to team-mate Rob Garofall to drive the final third in the inky black of the Hungarian night. Despite it being his first ever outing in the Le Mans Series Garofall picked up where his more experienced team-mate Hughes had left off, and racked up consistently quick times on a par with the front runners. The jovial Team RLR pilot enjoyed a very smooth run through the closing stages, stopping just once to put on fresh rubber and refuel before the final laps. By this point he was taking ten seconds a lap out of the GT2 cars ahead in the overall classification, and Garofall signed off his debut outing by snatching 18th overall from Tom Coronel in the Spyker with only minutes to go on the race clock. That handed Team RLR its desired result of a strong finish in the squad's first Le Mans Series race and a creditable 8th place in the hugely-competitive LMP2 class. "Mission accomplished as far as I'm concerned. We had the speed to be up there with the big boys who have been doing it for years if it hadn't been for a few small problems in the opening laps. We weren't the quickest when it came to the pit stops but we were precise and tidy and got the job done. I'm very happy with drivers, the car and the whole team." "I'm a little bit frustrated to have run into a few problems early in the race as that cost us dearly, but we fought back very well. Apart from that we were on a similar pace to the front runners and all three drivers showed how competitive they were. We have gained experience as a team that will set us up for the next round at Silverstone and also next year, which is where our real objectives lie." "It's a shame Barry [Gates] had such a difficult first stint as we were effectively out of contention before I even got into the car. Looking at it after the race we could easily have been in the top six on another day, but that's racing. The team did an outstanding job on their first Le Mans Series event, the car was consistently quick and reliable and we had no issues at all. We showed we had good pace and there were so many positives. I'm sure all the guys will have learned a lot and that will help their confidence massively going forward." "It's an incredible feeling just to be competing in such a great championship, and to pull off a result like this in our first race is superb for everyone involved in the team. I'm delighted for them because they have worked so hard to give us a car capable of taking on a really tough field and bringing home a result. To do what we did today was a big achievement on our first outing. I really enjoyed my time in the car towards the end as it was going perfectly and I knew I could keep putting in consistent laps and pass other cars right to the finish." For high resolution digital photographs, please visit the Hungaroring Gallery.